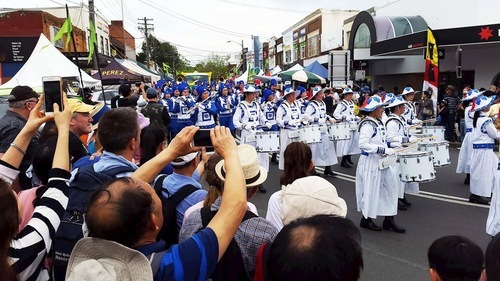 The Falun Dafa group was invited once again to perform in the Granny Smith Festival in the suburb of Eastwood on October 20, 2018. 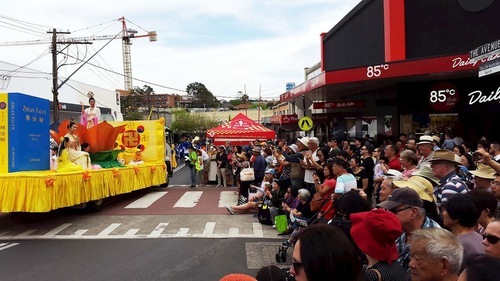 This event is the largest street festival in Sydney, attracting more than 80,000 spectators. The Tian Guo Marching Band in Tang Dynasty-style uniforms headed up the Falun Dafa procession, which was hailed as the parade’s largest and most eye-catching. Following the Falun Dafa float featuring a demonstration of the peaceful exercises, a lively waist drum team served as the grand finale. Chinese spectators take photos of the Falun Dafa group. 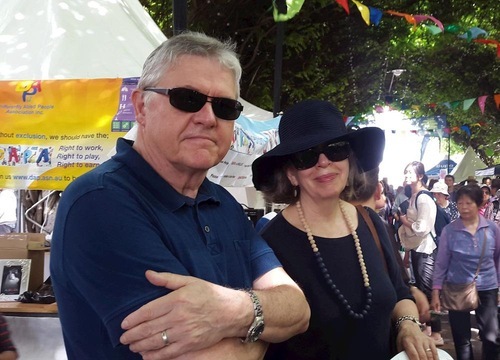 The Granny Smith Festival commemorates one of Sydney’s most famous citizens, Maria Ann Smith. During the 19th century she planted the first small green apple tree which was named after her and is now known worldwide. She added that the Falun Dafa group looked very elegant. “Their demeanor manifested the grace of Truthfulness-Compassion-Forbearance,” she said. Bronwen Elliott and her husband. 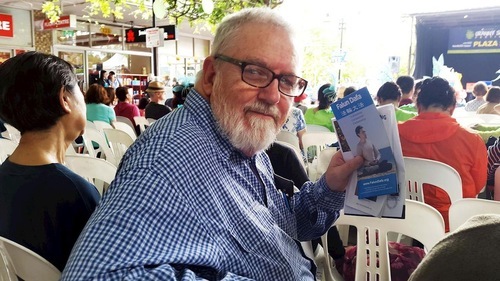 Jill Hartley, a member of the Greens Party, said that last month she noticed a group of Falun Dafa practitioners exercising in front of the Sydney Customs House. Many people stopped to watch, and she was also moved. Ms. Hartley said she could feel the pure and peaceful energy as the Falun Dafa contingent passed by, and that she admired their colorful and traditional costumes. She said she hopes that governments and people all over the world will stand up and demand that the CCP stop persecuting Falun Dafa. 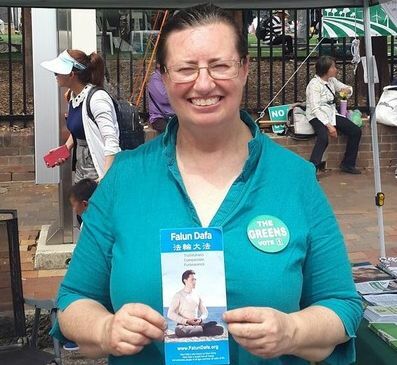 Jill Hartley, a member of the Greens Party, said the Falun Dafa group embodied pure and peaceful energy. 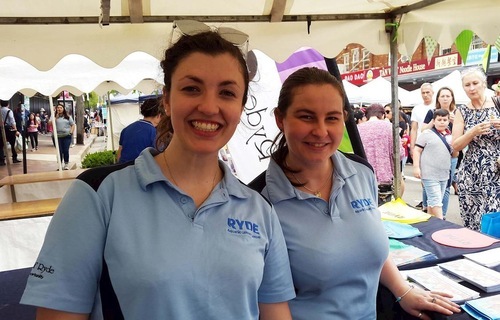 Xanthe Wills (left) was glad to see the Falun Dafa group in the parade. After the parade, practitioners were invited to demonstrate the exercises on the festival’s biggest stage. The practitioners invited audience members to learn the exercises at Eastwood Park, where there is a practice group that meets every morning. Gary Chams said he plans to learn Falun Dafa exercises.